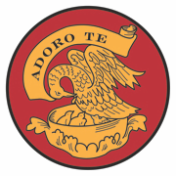 Adoro Te Families who have completed their 2018-2019 Registration will be able to access the links below and reply for specific activities. W = Weekly / M = Monthly / A = Annually. If there is no qualifier than the activity has an irregular schedule. We pray the Rosary throughout the year from September - May except during Lent when we pray the Divine Mercy Chaplet on Fridays. 1st Friday in December will have a special am schedule. 3rd Friday in December is a special scheudule. Activities end at 3pm. Check the Electronic Calendar for details. Note: No 4th Friday Activities in December. For a more detailed calendar, Adoro Te Families can visit the electronic calendar at the link above. 25 / F / Auditions, June Musical Mary Poppins Jr.
22 / F / Fourth Friday Activities Mary Poppins Jr.
29 / F / Fifth Friday – Stations Reh. 26 / F / Fourth Friday Activities Mary Poppins Jr.
31 / F / Rehearsal June Musical Mary Poppins Jr.
3,4 / M,T/ Rehearsals June Musical Mary Poppins Jr.
6,7 / Th,F / Rehearsal June Musical Mary Poppins Jr.
10-11 / M,T / Rehearsals June Musical Mary Poppins Jr.
13 / Th / Dress Rehearsal June Musical Mary Poppins Jr.
**Special Schedule: All activities on December 7 will be held in the morning due to an event in the afternoon. This page was updated January 14, 2019 at 11:17pm by DSM. This page was updated 11.18.18 at 3:09 pm by DSM. This page was last updated on 08.22.18 at 11:08 am by DSM.